The holiday season is such a sentiment-filled time to tie the knot. So you do want every last detail of your winter wedding to be just so—all the way to place card holders and presentation ideas! To help you decide on place card touches that are evocative of the season but also express your chosen wedding theme, we’ve gathered 14 creative finds from charmingly handcrafted to stylishly readymade. Just click on the links to either DIY or buy! The place cards themselves can be super simple but how you present them can be really cool, crafty and, yes, yummy! See the imaginative ideas below. 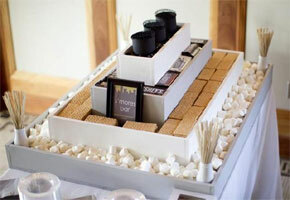 Propping your cards up on treats like cookies, candies and chocolates is such a delightful way to welcome guests to their places. Darling gingerbread cookies (1), whether home-baked or store-bought, can have the names simply piped on each one. Chocolate truffles (6) can serve as “stands” for glittery star toppers with decorative paper tags and bells. Personalized marshmallows (7) make a yummy idea, too! 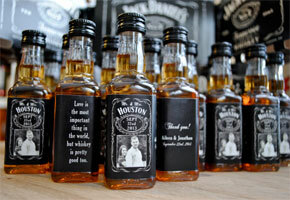 So just think of the place card possibilities with holiday cupcakes, cake pops, candy canes, even drinks garnishes! Wintertime accents that you can just pick up from your backyard or a forest trail are another wonderful option for DIY place card holders. Think twigs (2) tied together and trimmed with leaves and berries, pine cones (3) tipped with colored paint, or mini wood slices (4) giving a rustic touch to each place setting. So amazingly easy, yet so appealing! 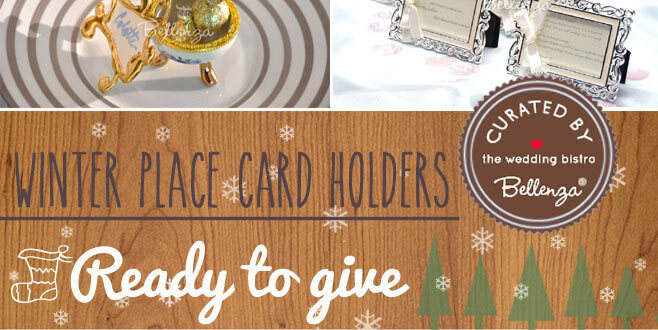 Holiday ornaments – Of course, if you’d like to bring the Christmas spirit into your wedding, do so through your place cards as well. Check out tutorials like this one for DIY snow globes (5) that incorporate your guests’ names and make lovely wedding keepsakes, too! You can also write on colored Christmas balls, tie name tags to beribboned sleigh bells, or put scroll tags across mini wreaths. If DIY isn’t quite your skill, then survey these stylish place card presentation ideas from wedding decor sources that are just a click away! 1 – Bianna art deco place card frames – Cards presented in stylish silver frames like these from Bellenza would go perfectly with a winter wonderland theme. 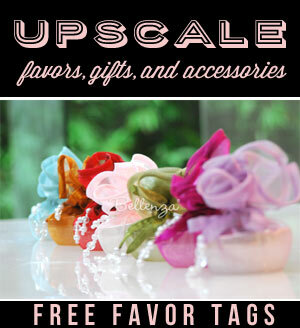 2 – Azuevo porcelain keepsake egg favors – Have your wedding favors double as place card props, too. Place a treat into these keepsake porcelain holders from Bellenza, and pair them with fancy name tags. 3 – Snow holiday ornament place card holders – Prop name cards into the top loops of these sparkly snowball ornaments from Beau-coup. 4 – Chalk reindeer place card holders – Get the convenience of a chalkboard on these cute metal figures from Pier 1. 5 – Miniature faux antler stationery card holders – Made from polyresin, these unique accent pieces available from Weddingstar can be glammed up for your winter wedding with gold-tipping (see the how-to here). 6 – Pearl and vintage gold wire napkin ring – These pretty napkin rings from Beau-coup make us think of poinsettias in pearls and gold. So elegant for a holiday wedding! 7 – Birch place card holder – Rustic and elegant! Ready to give as a winter favor as seen on Amazon. 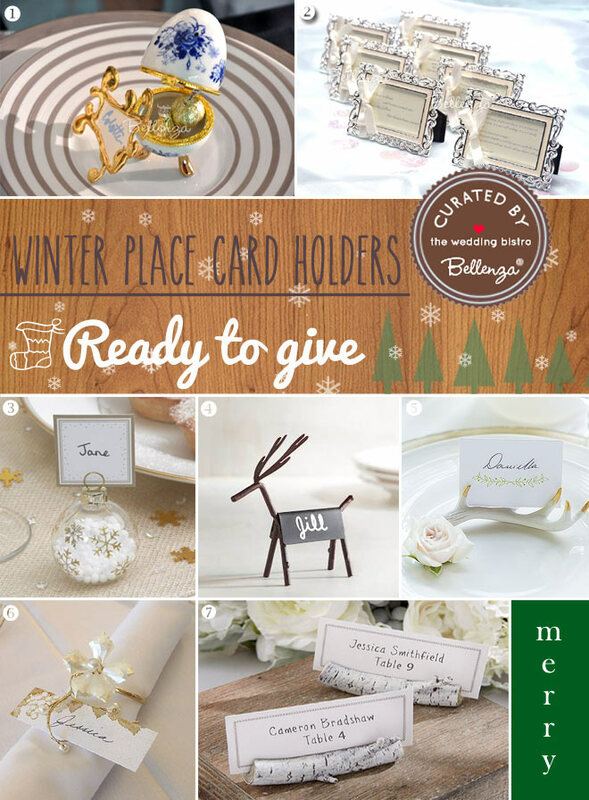 We’re sure you’re now all excited about the possibilities for presenting your winter wedding place cards. 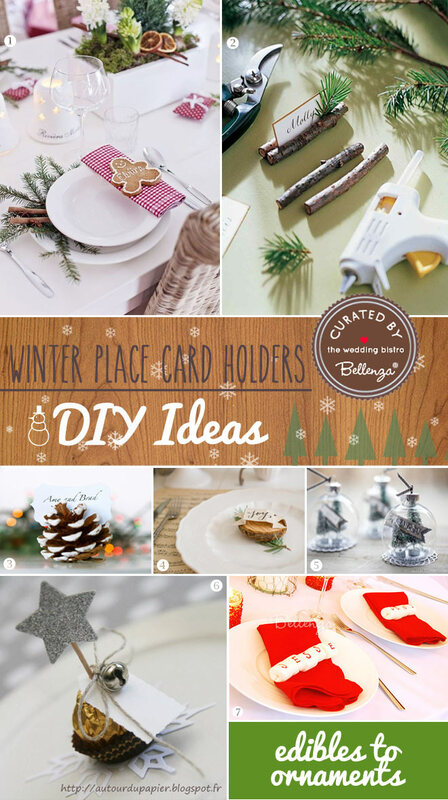 So, get ready, set…DIY or buy! Next Strawberries and Chocolate: A Recipe for the Perfect Proposal!